A local animal hospital is growing. A ribbon-cutting was held on Wednesday morning for the new addition at Perry Hall Animal Hospital. In 2012, the Baltimore County Council created the Perry Hall commercial revitalization district, and the Perry Hall Animal Hospital was one small business that took advantage of the incentives offered through the program. On Wednesday, the ribbon was cut on the new addition at the hospital, where the workforce has grown from 6 to 22 employees. The addition allows for more medical treatment space, a much needed staff break room and conference room, as well as an expansion of services. In 2016, the animal hospital demolished a decrepit building, expanding its parking area and improving the landscaping near Belair Road and India Avenue. Baltimore County recognized the Perry Hall Animal Hospital with an award in 2015 for its landscaping work, which has beautified this entire stretch of Belair Road. Fifth District Councilman David Marks was on hand on Wednesday morning, along with representatives from the Perry Hall White Marsh Business Association. 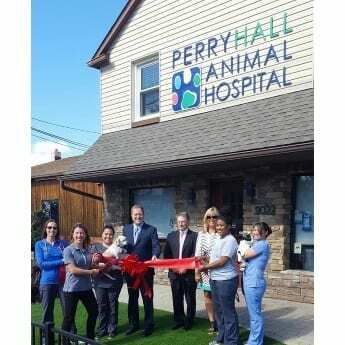 “The Perry Hall Animal Hospital is precisely the type of small business we wanted to help with the revitalization district,” said Marks, whose legislation created the zone.